Emotions are innate; they surface occasionally. But not all emotions are known to mankind. There are rarely some genuine moments that give us a chance to experience something deeper than the usual happiness and sadness. 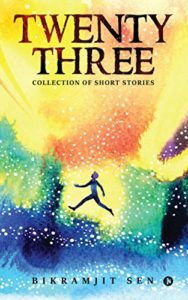 ‘Twenty Three’ is a collection of twenty-three short stories that speak about such sincere moments and elaborate on the emotions felt during those times. With an abstract cover having an amalgamation of different colours, each symbolizing a sentiment, this author does justice to the first look. Covering a vast range of topics like after-life, reincarnation, immortality, spiritual awakening, putting first things first (prioritizing) and introspection-retrospection- the stories have been cherry picked to elucidate each concept. However, the mix and merge is not uniform. Since it is always better to handle things one at a time, the author’s approach to deal with such topics in such brevity doesn’t leave the readers satiated. I. Psycho– a story that is totally relatable and explores a very genuine issue of the irrational behaviour of children. Other stories are good but they fail to pass the muster. Overall, considering that a 22-year-old has penned down this book, the effort of thinking out of the box and touching upon such offbeat topics is commendable. However, a more revised and topic-related selection would have been appreciated.